Changing technologies, easy access and reproduction of information and other content make the issue of copyright more complex than ever before. At ResourceLink we can help you navigate this copyright minefield, and at the end of this post is information specifically for teachers in Brisbane Catholic Education about the services we offer in this area. Today’s blog post, however, focuses upon the exciting and ever-expanding world of Creative Commons – an exciting development in the field of copyright that is well suited for the new digital and virtual content landscape. In 1986, a very inventive programmer named Richard Stallman developed a ‘C compiler’, which is a complex part of any operating system (such as Windows or Snow Leopard). The difference between Stallman’s work and that of the programmers working for Microsoft or Apple was that his C compiler was created in free code. In order to ensure that no enterprising programmer took this code and incorporated it into a piece of software that he or she would then put on the market, Stallman created something that changed history – the GNU General Public License. This license was the beginning of the copyleft (as opposed to copyright) movement. The licence required two things – that anything released under the licence be made freely available and that any software that incorporated it employ the same license – in other words, people could share the code freely and use it however they chose, as long as whatever they created using the code was also licenced in the same way, and was freely shared with others. From these beginnings, the copyleft movement has grown, and Creative Commons licensing is one of the best known results. Creative Commons is an effective way to source images, videos and documents while giving credit to the original owner. Creative Commons creates a “some rights reserved” model. This means that the copyright owner retains copyright ownership in their work while inviting certain uses of their work by the public. 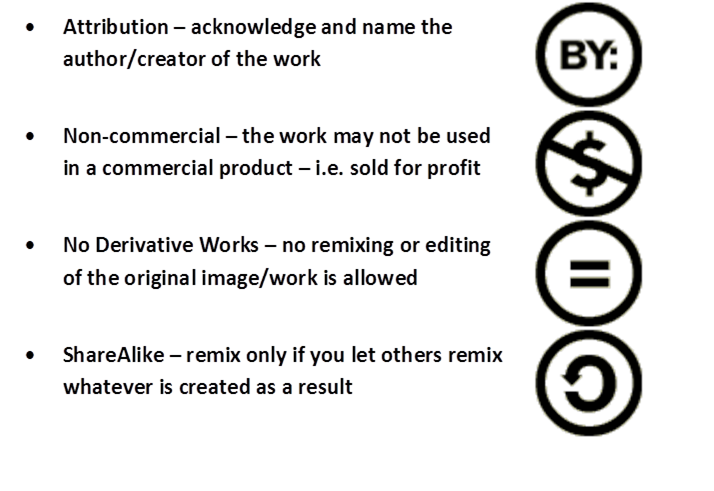 Creative Commons licences create choice and options for the copyright owner. Increasingly, teachers and students are moving from being consumers of information and content to becoming creators and publishers of information and content, due to the possibilities new technologies provide. There is also an increase in the publication of student work in the public domain. Whereas once student work was only displayed and shared in the classroom, nowadays work can be published online where the entire world may view it. This increases the importance of knowledge of copyright, as educational permissions do not apply once the work is broadcast to a non-educational audience. Therefore it is very important for teachers and students to be aware of the possibilities Creative Commons licensing affords. While Flickr has been a major source of Creative Commons licenced images, it has been more difficult to access digital video content that may be remixed or republished in the same way. From 9am tomorrow, this will no longer be a problem, with YouTube launching a Creative Commons library, allowing users to upload and share video footage that may be reused with attribution. This is a very exciting development in the history of Creative Commons, as not only does YouTube account for a huge amount of video content available online, it also sets an impressive precedent for other content providers to follow. Teachers within the Arts, English, ICT and any other area that requires access to editable film footage will greatly benefit from this launch. More information about this is available on the YouTube blog. Staff from QUT have created a cute video to explain the concept of Creative Commons to students. It is accessible on the SmartCopying website. Further information for teaching students about copyright is available on the All Right to Copy? website. http://wiki.creativeCommons.org/Film -Creative Commons wiki listing notable Creative Commons licensed films. http://www.oddjobjack.com/freejack.php -Master flash files and bitmaps of every piece of art used in the Odd Job Jack cartoon, available under a Creative Commons licence. ResourceLink has created an easy to understand booklet outlining the basics of Copyright as it applies to teachers, and this includes lists of where to source Creative Commons licenced material. Additional specialist information is also available for APREs. To download these booklets, go to ResourceLink’s Copyright information page (please note this requires a log in available only to Brisbane Catholic Education staff. The booklets are entitled: Copyright: Cutting through Complexity – Tips and Tools for those in schools and Copyright Advice for APREs and Campus Ministers. Howe, J. (2009). Crowdsourcing: why the power of the crowd is driving the future of business. New York: Three Rivers Press. This entry was posted in 21st Century Literacies and Skills and tagged copyright, creative commons by ResourceLink Brisbane Catholic Education. Bookmark the permalink. Great ‘catch up’ on Creative Commons. Being able to access video footage from YouTube Creative Commons will be most helpful for teachers and students. Hopefully it will enhance their willingness to develop skills in remixing and reshaping for a particular purpose. Always enjoy that Ken Robinson presentation on Creativity.